The array of sausages was mind boggling, the wild boar/venison/duck/pork prosciutto had our salivary glands on full throttle. Duck confit, smoked bison, need I write more? 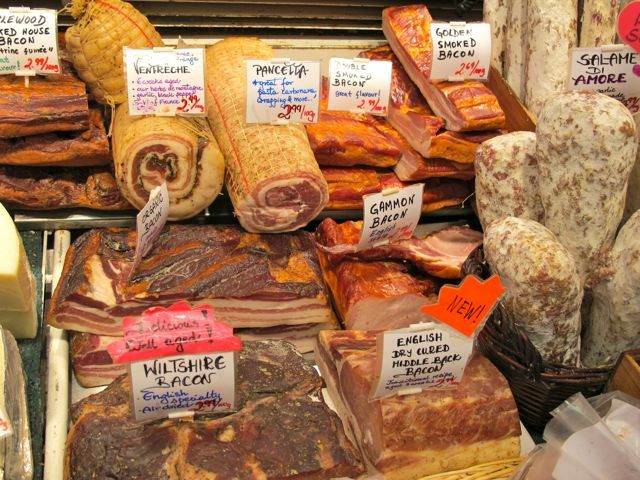 The bacon selection was likewise impressive and I was wishing we had rented an apartment with a kitchen so we could cook up some of these wonderful pork products! On the left, a gorgeous country ham for just $99, that’s roughly PHP4,300 — compare that with some locally prepared hams here in Manila at half the weight and a higher price! In other words, the country hams made in Canada, from free-range pork and aged for months or more until they have that depth of flavor that is so desirable, cost less than HALF the price of pinoy hams with little or no complexity! And this was retail at a recognized “tourist spot”!!! We couldn’t resist, Mrs. MM and I picked one item each at Oyama to include in our simple “market lunch” made up of items we purchased that morning… Our lunch break, up next. :) For more information about Oyama, here is their nice website. Oh my that’s sausage heaven! THANK YOU! I have been looking for a local supplier of country hams. Now I’ve found one and it is just at my back door. Can you imagine that? 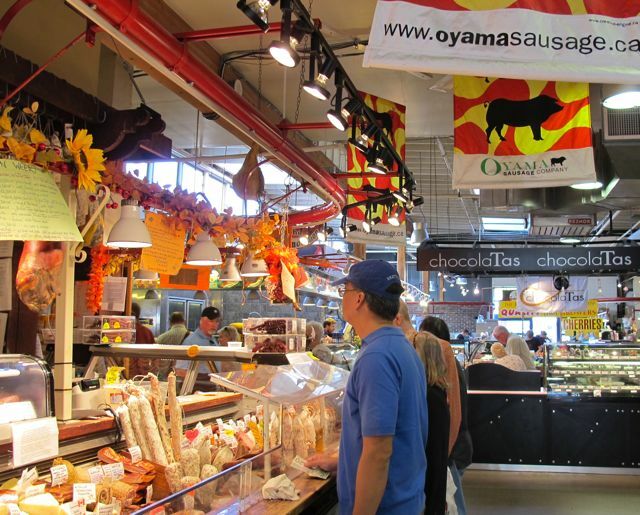 cwid….a must try also is Oyama’s Swedish ham…it is boneless, cured raw ham. I ordered it last Christmas….cooked it and braised it slowly in COKE CLASSIC, added some bay leaves, whole Chinese 5 spices, onions, etc. then glazed it with the reduced braising liquid. It was a hit! I brought it to a potluck together with pan de sal and aged cheddar…I was hoping there would be leftovers I could bring back home but NONE!!!! then if you have any leftover reduced braising liquid, buy Oyama’s DOUBLE SMOKED BACON…buy a chunk, then dice it yourself, render the fat and cook slowly in the reduced braising liquid above…when softened and blitz it for a few seconds….you have BACON CHUTNEY….serve atop a mini rice cracker! Things like these make me glad I’m a carnivore. MM, vancouver should pay you to be its tourism expert..am sure you made all your readers want to visit vancouver soon! bettyq, a mini chutney like no other! woohoo! Thanks for the tip, Betty. My holiday menu is now complete! Lee would be so happy here :). He could even be a decendant of the Oyamas..
Bettyq, I will try your Coke braising technique. However, what do you mean by whole Chinese 5-spices? 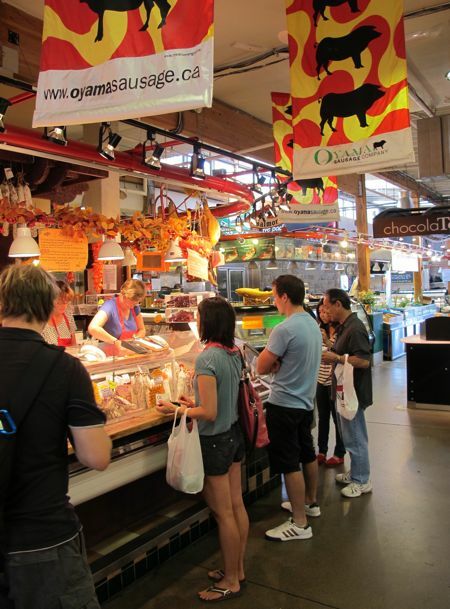 Granville Island Market definitely in the bucket list now…cheaper than a revisit to the La Boqueria…as a flag-waving carnivore, this is a ‘LIKE’…. My favorite spot at GI! 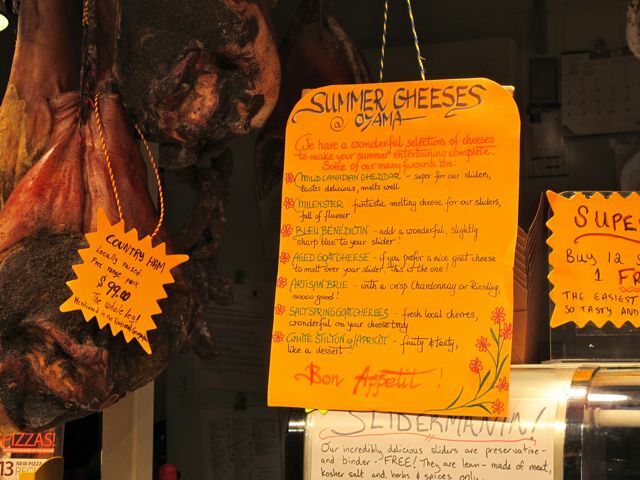 =) A couple of hundred grams of shikenspeck (sp?) or their smoked beef tongue , some smoked gouda, their spicy pepperoni stick, a couple of cheese buns or croissants from the bakery and you’ve got the makings of an awesome picnic! Oh and the best masala chai from the Granville Island Tea Shop. Hi Bettyq, thanks for the braised ham recipe. I will definitely try that. I wonder if it will also work with the grocery legs of ham that they usually sell during the holidays. 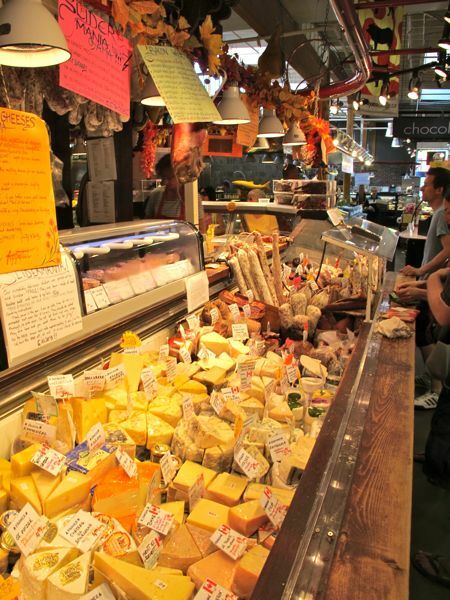 MM, I’m hoping you were also able to visit Pike Place Market in Seattle and make a comparison between the two. Personally I still prefer Granville Island Market. @Betty – I tried ringing you twice ( both cell and home # ) yesterday, but no luck. Will try again later today. The meats look good, as well as the cheese. Called to order – they don’t ship their products to the US. MP…if you do not have access to Chinese 5 spice, just add a few pods of whole star anise together with some white peppercorns, a FEW cloves and some fennel seeds a really short stick of cinnamon all wrapped up in cacha. Go easy on the spices or your ham will taste like CHAR SIU! Millet…another one that was devoured at his potluck I went to was my SMOKED CHICKEN MARMALADE. When chicken thighs go on sale, I buy them like there is no tom. Then debone them and brine them, and smoke them. Cool them and freeze. When I need them, I caramelize onions and char grill sweet peppers. Cut the smoked chicken to strips, add the onions, pepper strips and a touch of the reduced ham braising liquid which i freeze in little containers. When the chicken is nicely coated and glistening, cool. Serve on top of mini rice cracker too. Serve them at room temp. cwid…you know that I am always home! ….and if you want to try the Smoked Chicken appy, give me your boneless chicken thighs and I will smoke them for you…I can smoke about 48 chicken thighs per load. I’m so happy you got to visit Oyama. 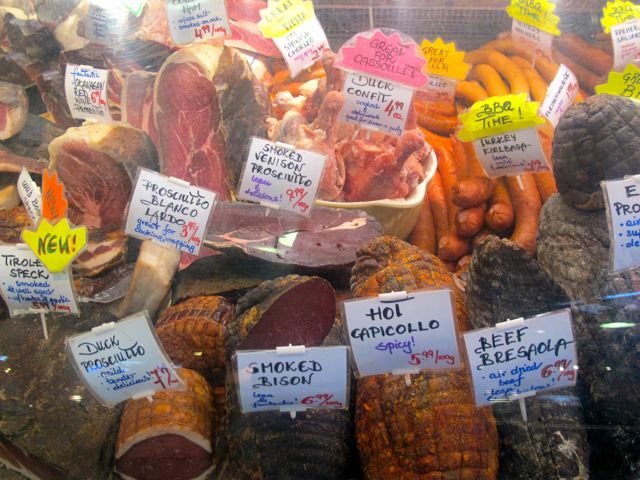 They are absolutely incredible and whenever I need to buy sausages or charactuerie meats, I always head straight there. They do Vancouver proud, that’s for sure. Betty Q., I’ll move to Vancouver!!!!! !… the pavlovian effect of this gastronomy overload is in full gear! Must be lovely to be your neighbor… has not forgotten your promise of the chocolate cake recipe. wow looking at all that pork is just electric! Those photos brought back memories when we were living in Vancouver. A lazy stroll, watching the buskers perform and having lunch and dinner is how we spend most of our Saturdays there. If you plan of visiting us here, let me know and I wouldn’t mind giving you a tour of the City. bettq, thank you for the tips above. will try them for the holidays. hi bettyq, just a few questions on the ham..do i have to cook it as per the instructions on the ham AND then braise it? or braise it right away? how many coke cans do i use? i want to try it for the holidays and was thinking of using it for a country ham. your answers will be appreciated. thanks! Shocks! I used to have an easy time copying, pasting and saving it in my USB but now I have to wait till I get home to do this. Ms betty q, any subs for the Swedish Ham? Thanks! Babalik na lang ulit ako sa Canada para maging kapitbahay din kita. Is your email working? MM, am i just dreaming to see the name ZUBUCHON at STALL 49 at Midnight Mercato for October 8, 2011… oh oh my.. napamalikmata ba ako…. but here i am to brave the rain and traffic or not at 10pm or earlier. karen…I just dump everything in the biggest stockpot I have that would fit the whole boneless, cured leg of ham (about 10 pounds) and let it braise in about 4 lts. of Coke Classic. Initially it will bubble up and as you cook it , the liquid will turn to like swamp water and but when you reduce it, it will turn to a golden burnt caramel color. Adjust the taste to your liking adding a touch of sugar if you want while cooking it. For every pound of raw cured ham, allow at least 20 to 30 minutes per pound….more if you start when the meat is cold. I use the whole Chinese 5 spices that I have wrapped in cacha. Some Chinese stores sell them packaged in cellophane or in small boxes. Howver, if you cannot find it, you can do without it. Just put a few star anise, white peppercorns and a few cloves. Wisdom tooth…I have done this using the ordinary bone -in ham as well you buy in grocery stores. It is good! In fact, I buy the ham when they are on sale, freeze them and when I need ham for sandwiches, I cook it this way. The boys would finish their sandwiches if I use ham braised first in Coke, very thinly sliced and piled high! thanks so much bettyq! and have a happy thanksgiving! Thank you Bettyq. Will surely try this soon!! Happy Thanksgiving Day!! The turkey have been deboned and rolled into a football…the dried wild mushrooms are rehydrating, will add fresh chanterelles later….oh….before I forget, wisdom tooth….you have got to try WILD MUSHROOM BREAD PUDDING for your Thanksgiving….MAAAASSSSAAAARAP!!!!!! !When you make it, caramelize first quite a bit of SWEET ONIONS and saute your mushrooms, etc. Add a touch cream cheese and the rest of the ingredients. Let it cool before you add the rest of the ingredients to make a custard such as eggs, milk/cream, a bit of chicken stock and add cubed bread….criossants if you have it preferably (I buy the day old ones …much cheaper!….and freeze them). This savoury bread pudding is ALWAYS the one that gets UBOS first! I do not make mashed potatoes anymore. This takes the place of the stuffing and the mashed potatoes. Make extra for your guests will ask to take it home! regarding sa stores near laspinas, there is BAKE MASTERS FOOD INGREDIENTS locate in BF Paranaque, they have all the items you need for baking… everything… from pans to boxes, from chocolates to sprinkles from flour to butter..
Been to that market many, many years ago and YES, I gained 10 lbs. just looking and another 10 lbs. eating what I purchased. Smuggled about 25 lbs home to Seattle at that time, but would not share with my neighbors, grrrr! turned into a watchdog, LOL!!!! I have a big Smoker and smake lots of different meats, sausages, fish and cheeses, but I have to admit that I still have a lot to learn to come close to their quality and taste. I’m thinking on building a big walk in smoker when I get situated in the Phils. and open a little cafe and bakery using the smoked items in the store. I better start sending hardwoods to my asawa in Cordova via balikbayan boxes. Zubuchon Restaurant — Mango Avenue Official Opening, Blessing and Eyeball Lunch!